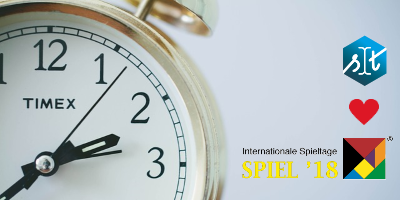 Zur Essen SPIEL 2018 biete ich allen interessierten Spieleautoren und Verlagen ein besonderes Schmankerl an: Ein kostenloses Blitz-Lektorat für Spielanleitungen: Rule Book Speed Dating. Kommt auf der Spielmesse vorbei, drückt mir Eure Textprobe oder die gelayoutete Anleitung in die Hand (oder sendet sie mir schon vorab zu) und erhaltet in wenigen Minuten wertvolle Tipps & Tricks zur Optimierung Eures Texts. Das alles persönlich, individuell und kostenlos! oder schreibt mir eine SMS an +49-178-1896669. For Essen SPIEL 2018, I’m offering a special treat to all interested game designers and publishers: Free rule book speed dating – a Blitz proofreading for game instructions. Come by at the game fair, give me your text sample or the ready-to-print instructions (or send them to me in advance) and receive some valuable tips & tricks for optimizing your text in just a few minutes. All this is done personally, individually and free of charge! PS: I’m also offering a regular sample proofreading free of charge. Visit spieletexter.de/probelektorat for more information. I would be very pleased to meet you! I have a simple 5 minute game I am looking to demo at spiel this year. When is the earliest I can get an appointment with you? Sounds good. The earliest possibility would be to meet at the Karma Games stand on Thursday morning: 2F107.